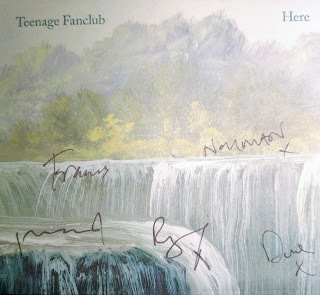 On 20th August Teenage Fanclub announced that the upcoming 'Creation Years' run of shows would be the last that would feature Gerard Love. Apparently plans to tour in Japan, Australia and New Zealand next year were not something Gerry the wanted to do and so the band and he have decided to go their separate ways. I found this news made me far sadder than I had expected. My love for the Fannies is deep. They are my favourite band of all time and I have nearly everything they have ever released. Due to the unusually democratic nature of the band, which since "Grand Prix" onward, has seen songwriting and lead vocals split pretty much equally on each album. Each songwriter sings their own songs live. What this means for the future of the band, beyond the announced overseas dates, I don't know. What I do know is that it won't be the same without Gerry. Sure they can get another musician to play the bass, but will they sing Gerry's songs or will Norman do this? Surely they are still going to play "Sparky's Dream" , "Star Sign" , and "Ain't That Enough" to name but three? What about future records; will this mean that only Norman and Raymond are writing all the songs between them? Will there even be another album? Too many questions that I clearly don't know the answer to. I do know that I'll always love the music the band have created, and will savour every note at the Barrowlands this October. It'll be bittersweet knowing that the 14th time I see them could be the last time with the "3 musketeers". I really hope Gerry will return in the future. "Set a course that I don't know"